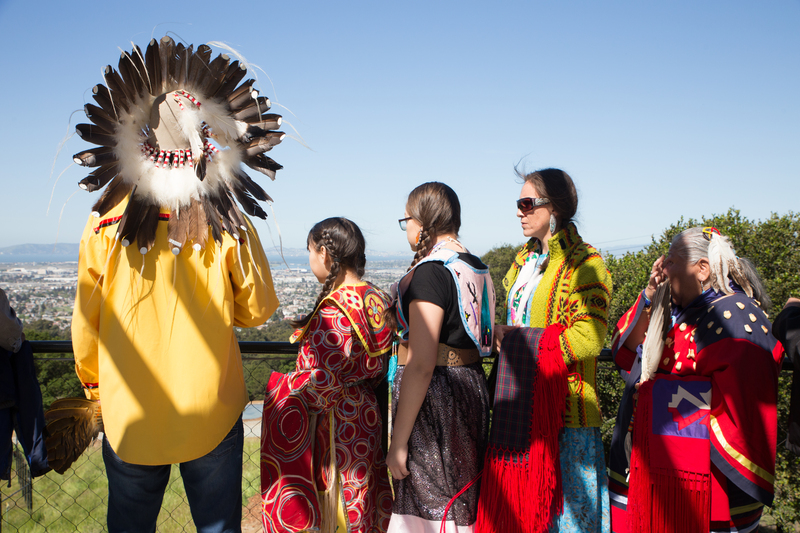 On a sunny, crisp day in April, LeRoy Little Bear and a dozen other tribal members from the Blackfeet Nation sang and danced a traditional rite to honor fourteen American bison they brought from Montana to the Oakland Zoo. 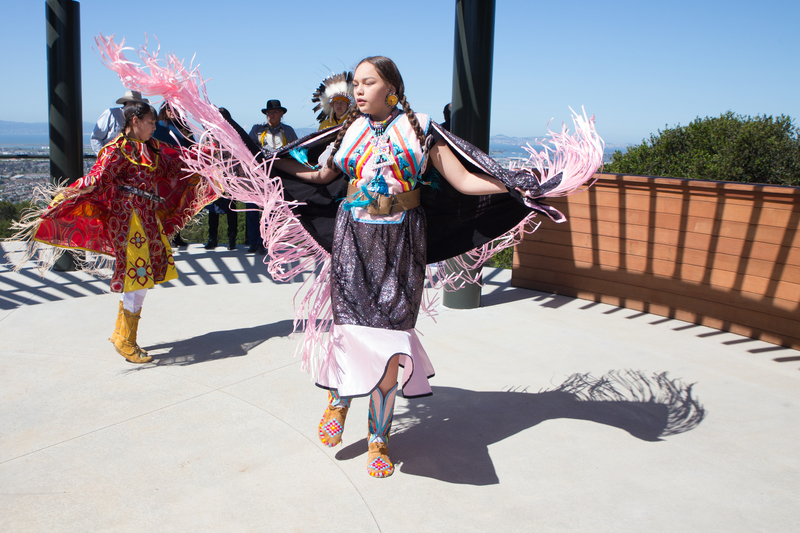 “Today is a very historic day because we’ve brought down buffalo that were almost extinct,” announced Little Bear from an overlook above the grazing herd. These bison are rare, he said, because they haven’t been bred with cattle, unlike most bison seen today. “You’re getting full-blood buffalo from the way they used to be,” Little Bear proclaimed with visible pride. 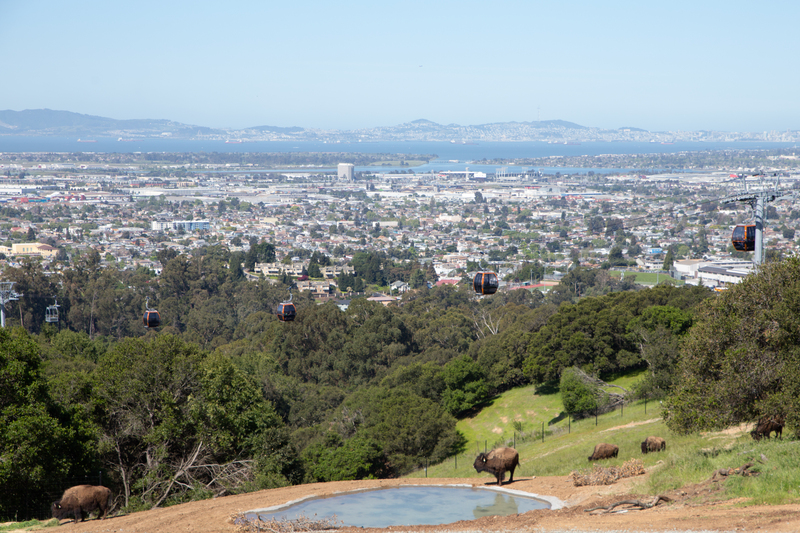 The bison are one of eight species at California Trail, the Zoo’s new exhibit hosting animals native — or once native to California. It's scheduled to open to the public in July 12. The bison, she says, are an example of how the zoo is trying to support animals in the wild. They will breed the bison and send the offspring back to the tribe to repopulate the wild herd. 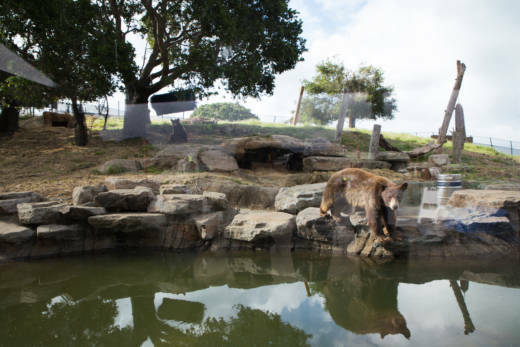 The zoo is also supporting a range of conservation efforts for each of their new animals, which include mountain lions, wolves, jaguars, California condors, bald eagles, black bears — even the long-extirpated grizzly bear. For example, the four black bears at the zoo — a mother and her three cubs — were rescued from Pine Mountain Club in Kern County. “There was a possibility of them all being put down because they were considered a nuisance,” said Gotliffe. The zoo is partnering with the Bear League in Tahoe that helps to deter black bears from wandering into human areas. The zoo is working with the Mountain Lion Foundation and the Bay Area Puma Project and has created a task force called the Bay Area Cougar Action Team. There's also a plan to help California condors and bald eagles recover from lead bullet poisoning and then release them back into the wild. 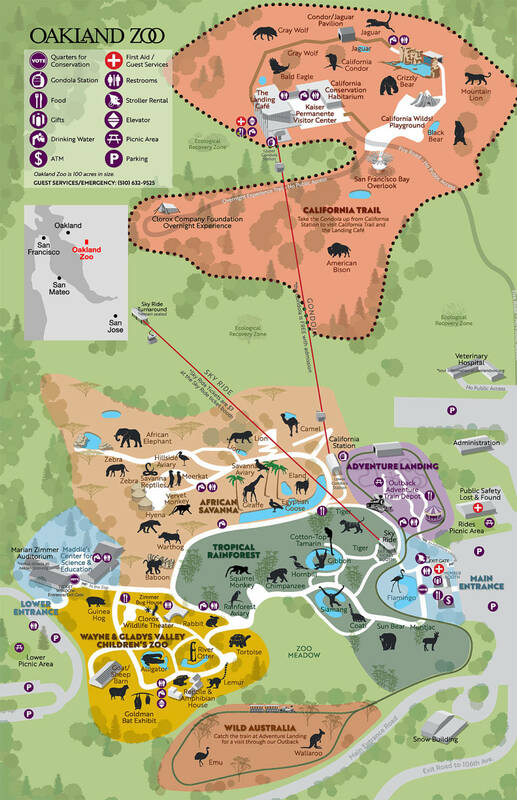 In order to support all these partnerships, the zoo contributes 50 cents of its admission price ($22 for adults) as well as a portion of future Zoo membership fees, to conservation funds. Managers expect to raise at least a quarter of a million dollars this fiscal year for conservation. The Association of Zoos and Aquariums, or AZA, recommends that zoos under its accreditation — like the Oakland Zoo — spend at least three percent of their revenue for conservation. 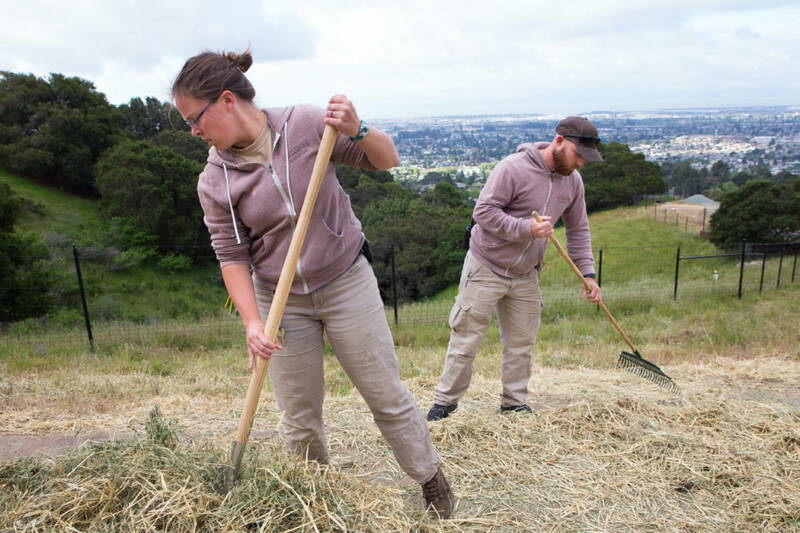 Ironically, to achieve these conservation goals, the zoo expanded into 57 acres of Knowland Park, cutting into habitat for the threatened Alameda striped racer — also known as the Alameda whipsnake — and the California red-legged frog. This angered park advocates who formed an organization called Friends of Knowland Park. In 2011, they waged a losing legal battle against the zoo and the City of Oakland, arguing that the city didn’t fully mitigate for impacts to the Alameda striped racer, native grasslands and sensitive plant species, like the Oakland star tulip and bristly leptosiphon. Under the existing requirements, the zoo must set aside 13 acres for native grasslands and 53 acres for the striped racer. “We don’t know if the snake is going to go into an animal enclosure and I’m not sure if that’s a good thing or a bad thing,” said Shawn Smallwood, an independent biologist from UC Davis hired by Friends of Knowland Park to review the zoo's plan. But, he added, when you are dealing with an endangered species you must err on the side of caution. “It’s just been so political,” says Karen Swain, the biologist hired by the zoo to monitor the frog and the snake during construction. She’s tasked with making sure construction workers don't harm the snake. In a way, the zoo is walking its own line: even making adequate space for its own animals remains controversial. “We are trying to provide these guys with as varied of an environment as possible, to help them not be sitting around all day bored,” says Heather Paddock, one of the zookeepers in charge of the black bears. The bears have more than an acre, dotted with dens, oak trees — even a swimming pool. 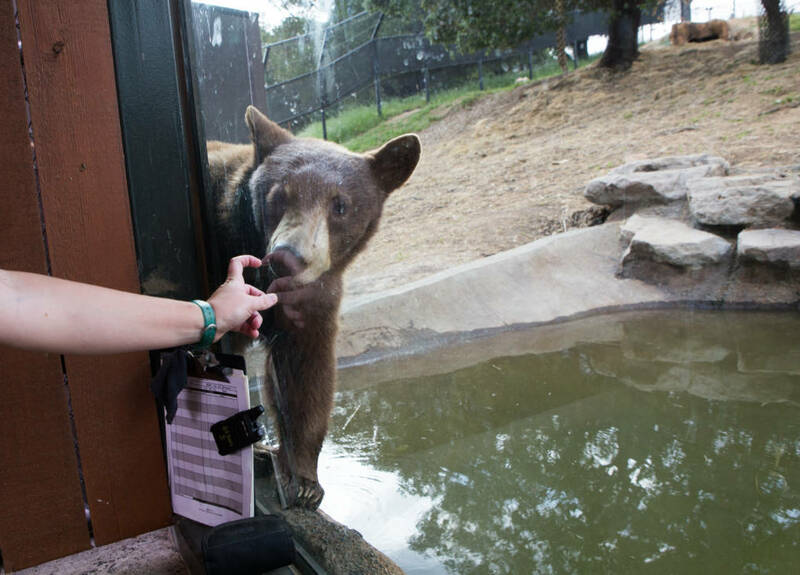 The zoo says the bears exhibit, as well as all of their new exhibits, exceed the industry’s best standards. But Mark Bekoff, an Emeritus Professor of Ecology who studies animal behavior at the University of Colorado, says zoos shouldn't keep large predators because of their need to roam vast distances and hunt prey. “Wide-ranging carnivores are among the animals who suffer the most when they are put into a cage," he said, referencing a 2014 study published in Nature. While Bekoff agrees that zoos should take in animals who have nowhere else to go, like these bears, he wants them to have more choice and control over their lives. Zookeeper Paddock said she is trying to compensate for this with training and enrichment activities. 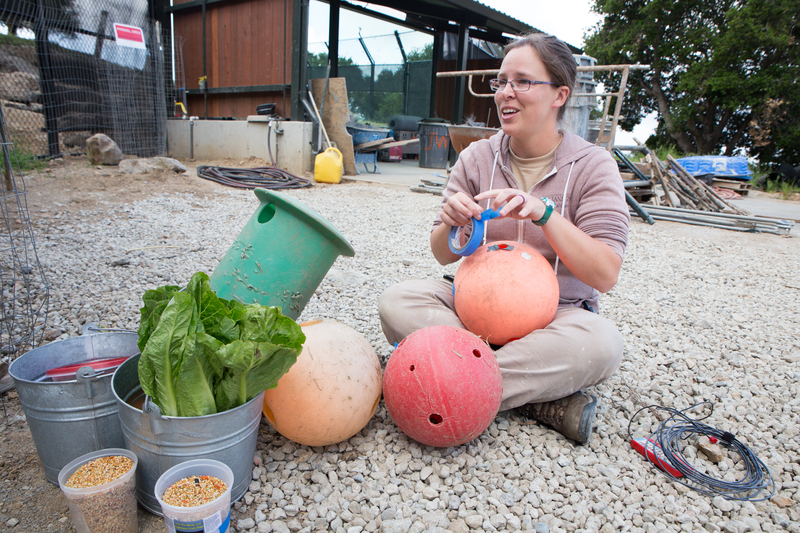 “We are providing them enrichment every single day, whether that's a new food item or a new device, a toy, a new scent,” she said as she fed the black bears a mixture of bird seed, mealworms, romaine lettuce and oranges. But Bekoff maintains that animals need privacy, too. But Paddock says the public needs to connect with these animals so they care about saving them in the wild. “You know the wild isn't butterflies and rainbows for a lot of these animals," she says. "They're getting pushed further and further to the fringe of wild spaces." Ultimately, that fringe habitat could be the last refuge — for both snakes and bears — because there just isn’t enough wild space left.